The thirty-four prose sections of Jared White’s This Is What It Is Like To Be Loved By Me each begin with the title phrase, but only the first instance uses it as a complete sentence: “This is what it is like to be loved by me.” In all the other pieces, the opening phrase leads into something else, such as, “This is what it is like to be loved by me if my breath went down into my stomach and my food went down into my lungs,” or “This is what it is like to be loved by me in a dark forest midway through my life,” or “This is what it is like to be loved by me but I’m not me! I’m some wolf!” The cumulative effect of the repeated phrase is somehow both dazzling and grounding. I could read the words in my mouth because the words have words written on them each word inscribed with the the word it is and each mouth tattooed mouth color with the word mouth in the language the mouth speaks, not mouth as it might be celestial and expensive but affordable mouth, adequate and obvious and constantly available. Happy character, mouthing ablutions of words read and knowing how unlonely it is to be the same in Philadelphia as in New York. Further, it is a far-reaching, tender, and thoughtful poem that employs humor and also can be enigmatic at times, which ultimately comes across as a deeply human poem. With its casual tone, quiet intelligence, and sincerity, it is reminiscent of New York School poetry, especially that of Frank O’Hara and Ted Berrigan. Fluctuating between subtlety and exuberance, This Is What It Is Like To Be Loved By Me is a poem that will stay with the reader long past its end and would be well-worth revisiting. Brenda Sieczkowski’s Wonder Girl in Monster Land is a series of poems centered around a girl named Yomi, whose name is Japanese for “land of the dead.” The character-driven series fits in well alongside other recent character-driven works, such as CA Conrad’s The Book of Frank and Danielle Pafunda’s “Mommy V” from her book Manhater. And like Conrad’s and Pafunda’s works, Sieczkowski’s has a dark edge, and there is also playfulness and humor too. Many of the poems are in prose, but they’re broken up by a number of “little songs,” which are each rhymed pieces consisting of two sestets. This adds to the collection’s playfulness, creating a children’s book-like quality. There are also visual pieces–concrete poems, one poem whose second stanza is shaped like a mushroom, and another poem that takes the shape of a hot air balloon. There are also illustrations depicting moments from the poems, and the book closes with “10 Amendments (An Erratum),” which advises, “Where text says song, read ghost. * Where text reads ghost, see further.” While there is certainly something sinister belying Wonder Girl in Monster Land, reading it is wicked good fun. 8th Grade Hippie Chic is available from Immaculate Disciples Press. 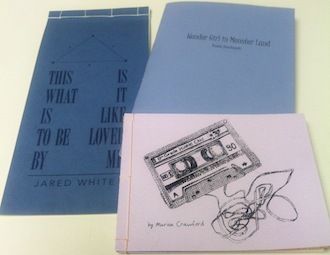 This Is What It Is Like To Be Loved By Me is available from Bloof Books. Wonder Girl in Monster Land is available from dancing girl press.